In general, us human way overcomplicate health, especially when it comes to food. Since starting Summit Fit, I have adopted a way of eating that is so easy it’s almost feels like I’m cheating most days. I believe that most people need to get a deep understanding of nutrition, as we’ve strayed so far from the way our primal ancestors ate, which is why I created my 6-week course. But after a period of relearning how to feed the body and eat in the way I’m going to describe in this post, I don’t believe you need to count or measure your food ever again. You simply need to come back to these principles over and over again the rest of your life. I believe you can have soaring energy levels, mental clarity, burn fat effortlessly, minimize sugar cravings to basically nothing and feel confident and in control around food within just a couple of weeks with my 6-week course. Anybody who tells you a calorie is a calorie truly misunderstands nutrition as it’s most basic level. We know that the way an Oreo processes in the body is entirely different than a strawberry. At a cellular level, strawberries heal and restore and process appropriately to keep your body functioning at is highest capacity, unlike the foreign substances found in Oreos which float around in the body never fully breaking down. Keep insulin levels low to avoid fatigue, sugar cravings, brain fog, storing fat and chronic disease. Heal the body from the inside out to restore wellness in the entire body rather than following another diet. Fuel our workouts with gut-healing foods so we can build lean muscle and live strong, energized lives. So, how do we make nutrition an effortless process that doesn’t require obsessing over calories and macros the rest of our lives? Take last night’s dinner as an example…. I almost always have grass-fed beef and a plethora of green vegetables in my refrigerator. 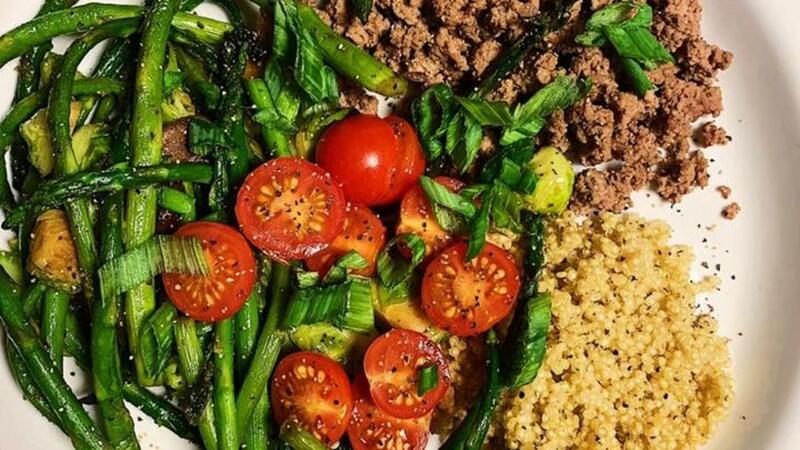 When thinking about nutrition and “how to eat right” for optimal energy and fat burning, it’s best to think about how to fill your plate (what foods you need to add versus take away). Half of it should be loaded with low-starch veggies like dark leafy greens and cruciferous veggies. About 1/4 of it should be protein and then 1/4 a complex carb like quinoa or roasted carrots…unlike most American plates which are an absolute carb bomb that spikes insulin to obscene levels (hence the drastic rise of diabetes and chronic disease in both adults and children alike). As I went to make dinner last night, I didn’t have a recipe in mind, I had a way of cooking in mind. My typical way of cooking is a quick and easy veggie saute, an effortlessly cooked protein and lots of flavor. I pulled out some beef, asparagus, mushrooms, tomatoes, brussels sprouts and quinoa. The quinoa got put on first as it takes 10 minutes or so to cook. I add 1 cup with 2 cups of water, a spoonful of Better Than Bouillon Chicken stock (a great, junk-free staple for when you don’t have broth on hand) and a pat of butter with salt and garlic powder. I mixed all of this together brought it to a boil and then added a lid to let it simmer for 10+ minutes. While that was cooking I added beef to a cast-iron pan to brown, seasoned with salt, pepper and garlic salt. As that was browning I chopped some brussels sprouts, cut the ends off of the asparagus, halved a few cherry tomatoes and roughly chopped some mushrooms (keep the pieces bigger as they shrink fast!). For the veggies I heated up another cast-iron pan with a pat of butter and avocado oil. I added all the veggies (minus tomatoes) with some coconut aminos + fresh cracked salt and pepper. I added a lid and stirred occasionally until veggies were a bit softened. As the quinoa, beef and veggies finished cooked, I quickly seared the halved tomatoes just to soften and warm up a bit. To serve, we added everything to a plate with a few chopped green onions (I serve so many things with that as it’s great prebiotic food for feeding healthy gut bacteria). The beauty of this meal is that I could have done this with any number of veggies or protein sources. Sub chicken or ground turkey. Use broccoli instead of asparagus. Chop cabbage in place of the brussels sprouts. I use coconut amino to saute all of my veggies so I highly recommend having that on hand as a staple. For Quinoa: Add 1 cup quinoa with 2 cups of water, a spoonful of Better Than Bouillon Chicken stock (a great, junk-free staple for when you don’t have broth on hand, just omit if you don't have on hand) and a pat of butter with salt and garlic powder. Mix all of this together, bring it to a boil and then added a lid to let it simmer for 10 minutes. For the Beef: Add 1 lb grass-fed or organic beef to a cast-iron pan to brown, season with salt, pepper and garlic salt to taste. For the Vegetables: Heat up another cast-iron pan, add a pat of butter and a bit of avocado oil. Add all the veggies (minus tomatoes) with some coconut aminos + fresh cracked salt and pepper to taste. I added a lid and stirred occasionally until veggies were a bit softened (about 5-7 minutes). For Tomatoes: Just before serving meal, add halved tomatoes to the cast-iron skillet you cooked your veggies in. Sear them for 1 minute or so until warm and softened. To serve, add all ingredients to your plate. Top with diced green onions and fresh black pepper. Want to learn how I help my students lower insulin to completely zap sugar cravings, burn fat effectively and create an effortless relationship with food? Grab a spot in my upcoming 6-week course. I give you the A-Z education you need to heal the body and keep it that way long-term.